Custom Meeting Planners | Meeting Your Needs. Planning for Success. 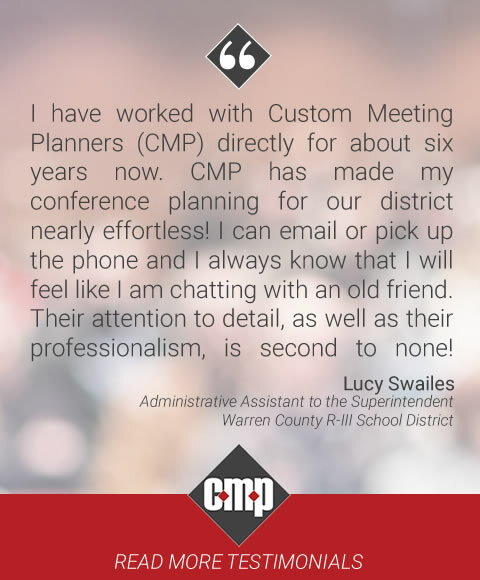 CMP has been in the business of saving our clients time & money since 2005. We offer a full array of meeting planning services customized to your specific needs. By familiarizing yourself with our company, you will find our services to be extensive yet affordable. Our team of professionals is able to bring revenue generating and cost-saving ideas to the table. When choosing a conference planner, it is helpful to pay close attention to their experience. You should examine their past conferences, and the outcomes of those conferences.